Realised by JP Baril (jpb63). 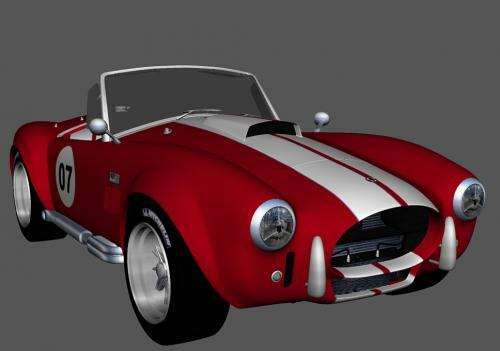 The “COBRA_SpiderCar” for VSF incorporates the technical features of the “COBRA model 427 Shelby AC”. Apply the instructions in the "settings" and “notes” files for the best effects. La « COBRA_SpiderCar » pour VSF reprend les caractéristiques techniques de l’ « AC COBRA model 427 Shelby ». Appliquer les consignes des fichiers « settings » et « note » pour avoir les meilleurs effets. 1. Make another copy of your Harley Super Sport and name it anything else you want to. 2. Copy all the files from the original folder into the new folder apart from body.jpg. 3. Then finally, copy the new body.jpg file into the new folder. Please note that you need to have the original one as this is only the textures. 1. Make another copy of your Harley Super Sport and name it "Harley_Super_Sport_Green" or anything else you want to name it. Please note that you should have the original model as this is only the textures! Here we have a repaint for Deutschmark's Harley Super Sport Add-on, which makes it color red and adds a few rust on it. 1. Make another copy of your Harley Super Sport and name it "Harley_Super_Sport_Red" or anything else you want to name it.